Salamander Trust was commissioned by WHO to conduct a global values and preferences survey on the sexual and reproductive health and rights of women living with HIV, to inform the development of its new Guideline. The new full 2017 Guideline on this topic from WHO can be found in English here |en español aqui. The Executive Summary of the 2017 Guideline on this topic from WHO can be found in English here | en español aqui | en français ici. | Portuguese | Russian | Arabic. Our ‘Building a Safe House’ survey report, which informed this Guideline, can be found here. Scroll down to December 2015 to find two JIAS articles about gender-based violence and mental health respectively. To view articles about the methodology, scroll down to April 2016 and February 2016. To see a summary of various outputs from the survey and Guideline development process, click here. We are delighted that UNAIDS has now endorsed the Checklist to support the Guideline implementation. Edition 3 of this Checklist can now be accessed here. The 2nd edition of the Checklist was released. A webinar about the Guideline and Checklist on 9 July is available here. UNAIDS has published a webstory about the pilot workshop that it funded in Kenya, coordinated by WOFAK, to test the new Checklist. One of the key findings from the workshop was concern about high levels of discrimination in healthcare settings in Kenya. To read the webstory, click here. To mark World Health Day and the 70th Anniversary of WHO, together with colleagues around the world, we launched a new Generic Checklist to support women living with HIV and others to implement the new Guideline in their own country. (See above for latest edition.) To read more about this Checklist and why we all think the Guideline is so important, click here. A launch of the new Guideline took place in London, co-hosted by WHO and the Royal College of Obstetricians & Gynaecologists. To view a presentation from the evening, click here. To see the comments of women who formed the Global Reference Group for the Global Survey, and other colleagues, click here. To access WHO regional webinars about the new Guideline, click on the relevant links. WPRO/SEARO; PAHO (English); PAHO (Spanish); African Region (English); London launch: Storify; and Comments from women living with HIV who were involved. To access two related articles about psycho-social support and about using GRADE as a research framework, click on the relevant links. 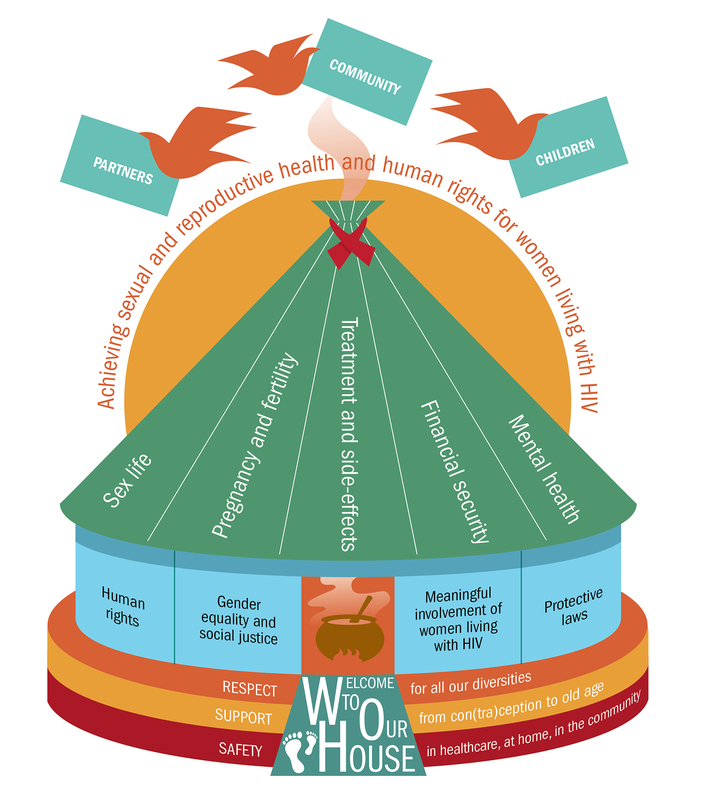 A presentation about the findings, especially in relation to violence experienced by women living with HIV, was part of a WHO webinar on sexual and/or intimate partner violence in the context of HIV. This webinar took place on 17 October 2016. To access the presentation based on the WHO survey, click here. Just published at the International AIDS Conference in Durban. This poster highlights some of the treatment side-effects which women living with HIV experience and their effects on our sexual and reproductive health and rights. Just published: another article about the participatory methodology we developed for this survey. This article, in the Journal of Virus Eradication, can be found here. In addition, in April 2016, a poster based on the UK findings from the global survey, won a joint Mediscript and Brisith HIV Association award at the British HIV Association annual conference, for the best poster for work in the field of social sciences or community-based work. This poster was presented at the conference jointly by Salamander Trust and our sister organisation, the Sophia Forum. A presentation was made about the Russian-language respondents’ data in March 2016 at the Eastern Europe and Central Asia AIDS Conference. This can be found here. Just published: an article about the participatory methodology we developed for this survey. This article, in the WHO Bulletin, can be found here. A presentation on the findings of the survey was made at a UN Women international meeting in New York. This was entitled: “Strategic Discussion on gender equality and HIV/AIDS: Putting Gender Justice at the Center of the Fast Track to End AIDS”. The presentation can be viewed here. Just published: 2 articles based on findings from the survey. These articles, part of a JIAS Special Supplement, are about GBV and Mental Health issues. Also available in Spanish here: about gender-based violence; and about mental health. Many thanks to Marijo Vazquez for translating them! Webconference in Spanish: 24 November 2015. To access the archived recording please click here. To access the report in Spanish please click here. Panel to present and discuss the findings at FIGO International Conference, Vancouver. Click here to see the presentation. Following a two-day stakeholders’ consultation meeting at WHO in Geneva, we have great pleasure to launch the English report of this global survey. This report is also now available in Spanish here. To read our statement regarding this launch, please click here. This survey is now closed. A huge and heartfelt THANK YOU to all who took part and who helped to disseminate info about the survey. We had a total of 824 responses from women living with HIV from 94 countries around the world. Their ages range from age 15 to 72 years old. We will provide more information on this website soon. Salamander Trust is consulting women living with HIV to hear our experiences and priorities. This is a community consultation, developed with a Working Group of women living with HIV from around the world including trans women. We are inviting you to take part in this global survey. There will also be a number of small face-to-face community dialogues and in-depth interviews. Your participation will help. The survey has a required and an optional part. It is up to you how much you complete; the required section takes about 10 minutes, and the optional questions take about 30 minutes if you choose to do them all. Findings from the consultation will feed into the updated WHO Guideline. This version of the on-line survey is in English. A Word version is available from us – or also here – for those who have limited access to the internet. Other language versions, both on-line and in Word, will follow in a few days. You can write your replies in any language. The survey will now run until Sunday 8th June 2014. Salamander Trust est en train de conduire une consultation auprès des femmes vivant avec le VIH pour écouter leurs expériences et leurs priorités. Il s’agit d’une consultation communautaire développée par un groupe de travail composé de femmes vivant avec le VIH et provenant du monde entier, y compris des femmes trans. Vous êtes invitées à participer à cette enquête mondiale. Nous organiserons également un certain nombre de dialogues communautaires en tête-à-tête et des entretiens en profondeur. Votre participation nous sera de grande aide. L’enquête contient une section à laquelle il est nécessaire de répondre et une autre qui est facultative et que vous êtes libres de compléter. Cela vous prendra environ 10 minutes pour compléter la section obligatoire et environ 30 minutes pour compléter les sections facultatives si vous choisissez de répondre à toutes. Les résultats de cette consultation serviront pour mettre à jour les lignes directrices de la OMS. L’enquête durera jusqu’au dimanche 8 juin 2014. La Organización Mundial de la Salud (OMS) está actualizando sus Directrices 2006 sobre Salud Sexual y Reproductiva y Derechos Humanos de las mujeres viviendo con VIH (ver http://www.who.int/hiv/pub/guidelines/sexualreproductivehealth.pdf?ua=1). Salamander Trust ha puesto en marcha una consulta entre mujeres viviendo con VIH para conocer mejor nuestras experiencias y prioridades. Se trata de una consulta comunitaria elaborada por un Grupo de Trabajo de mujeres con VIH de todo el mundo, incluyendo mujeres transexuales, y las invitamos a tomar parte respondiendo a esta encuesta a nivel global. También tendrán lugar varios diálogos comunitarios presenciales y entrevistas en profundidad. Su participación será de gran utilidad. La encuesta consta de una sección obligatoria y una sección opcional, de forma que de ustedes depende qué quieren compartir. Se tardan unos 10 minutos en completar la sección obligatoria y unos 30 minutos más si deciden responder a todas las preguntas opcionales. Los resultados de la consulta se incluirán en la actualización de las Directrices de la OMS. El plazo de recepción de formularios estará abierto hasta el domingo 8 de junio de 2014. En nombre de Salamander Trust y sus asociadas. Salamander Trust проводит консультации среди женщин, живущих с ВИЧ, чтобы услышать наш опыт и приоритеты. Это консультация сообщества, разработанная рабочей группой женщин, живущих с ВИЧ, со всего мира, включая трансгендерных женщин. Мы приглашаем тебя принять участие в этом глобальном опросе. Также будет проведен ряд небольших очных диалогов на уровне сообщества и глубинных интервью. Твоё участие поможет. Опрос имеет обязательную и необязательную часть. Это на ваше усмотрение, как заполнять опрос; обязательный блок занимает 10 минут, а необязательные вопросы займут 30 минут, если вы выбрали их. Данные, полученные во время консультации, будут использованы для обновления руководства ВОЗ. A organização Salamander Trust pretende consultar as mulheres que vivem com VIH para conhecer as nossas experiências e prioridades. Esta é uma consulta à comunidade, desenvolvida com um Grupo de Trabalho de mulheres que vivem com VIH em todo o mundo, incluindo as mulheres transsexuais, e convidamo-la a participar nesta pesquisa global. Também terão lugar vários diálogos comunitários presenciais e entrevistas aprofundadas. A sua participação é bastante importante e útil. O questionário apresenta uma parte obrigatória e uma opcional e cabe-lhe a si determinar o quanto completa. A parte obrigatória requer cerca de 10 minutos, e as perguntas opcionais demoram cerca de 30 minutos, se optar por responder a todas as perguntas. Os resultados da consulta serão integrados nas Diretivas atualizadas da OMS. O questionário decorre até sexta-feira 8 de junio de 2014. Salamander Trust adalah konsultan bagi Perempuan dengan HIV sebagai penghubung untuk mendengarkan pengalaman dan prioritas kita. Ini merupakan konsultasi komunitas yang dikembangkan dengan Kelompok Kerja Perempuan dengan HIV dari seluruh dunia termasuk perempuan trans. Kami mengundang Anda semua untuk berpartisipasi dalam survey global ini. Kemudian selanjutnya akan terdapat dialog kecil tatap muka dengan komunitas dan interview mendalam. Partisipasi Anda akan sangat berguna. Terdapat dua bagian dalam survei ini yang wajib diisi dan menjadi pilihan saja. Tidak ada paksaan pada Anda untuk melengkapinya, bagian yang wajib diisi akan membutuhkan kira-kira 10 menit dan pertanyaan pilihan akan membutuhkan waktu kurang lebih 30 menit jika Anda memilih untuk menjawab semuanya. Temuan dari konsultasi ini akan menjadi masukan untuk perbaruan Pedoman WHO. Survei akan berlangsung hingga 8th June 2014.